Does Ukraine merit a new handout? Yesterday the International Monetary Fund approved a further bailout of more than US$1 billion for Ukraine, a country trying to deal with an aggressive eastern neighbour and a ruling elite compromised by corruption. If the decision to resume payments was based on the normal loan conditions, the outcome would have been an obvious no. Ukrainian institutions remain weak, corruption is rife and the citizens who suffer most are disillusioned with their leaders. But politics has prevailed and Ukraine will be given another lifeline. The government should not be complacent; the stakes are too high. Ukraine will remain a country with its hand out, vulnerable to corruption and state capture, unless it can fix its economy and end impunity. The well-being of the country depends on investment and neither foreign nor local investments will flow into the country as long as judicial institutions are weak and corruption remains the norm. Just one per cent of people say they trust in the courts. This is not surprising. The fact that there has been no success getting back the assets stolen by the former President Viktor Yanukovych is symbolic of a system that isn’t working. 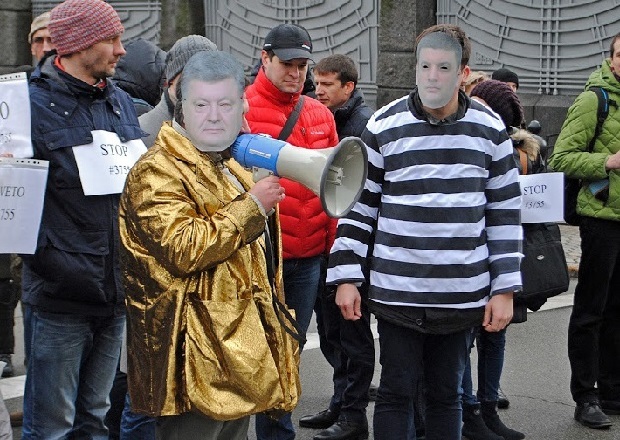 Last week the State Financial Monitoring Service reported the amounts of money embezzled by Yanukovych and his associates totalled US$7.5 billion. When I met with President Poroshenko in June, he made a commitment to follow up on the case of Yanukovych. This money must be returned to Ukraine, but this will only happen when the General Prosecutor Office conducts an effective investigation into the Yanukovych clan. These kinds of investigations are hamstrung by a judicial system that is not fit for purpose and a governance system that is dragging its feet over reform. A blue print for a strong judicial system that is fair and independent – from the police on the streets to the judges on the Supreme Court and everyone in between – requires an end to the cronyism perpetuated by an oligarchy that has acted with impunity for a decade. A well-resourced Anti-Corruption Court that is transparent in its operations and independent would be a good start. The reason people have no faith in the court system is that too often it seems rich crooks can buy acquittals and poor crooks end up in jail. Prosecution and conviction rates mean little if justice can be bought. An Anti-Corruption Court could be established happen as early as this autumn with relevant amendments to the legislation with the first cases heard in first quarter of 2017, but only if there is political will. Donors providing international financial aid should take into consideration independence of the judiciary and the establishment of functioning anti-corruption courts. There is also the option of looking at external pressure. CICIG, the International Commission against Impunity in Guatemala was created by United Nations and installed in Guatemala in 2008 to help push forward investigation. The CICIG is headed by a former international prosecutor and is made up of about 30 international investigators of different nationalities. They work together with an elite unit of local prosecutors conducting investigations of crimes of high impact. What is clear is that both the National Anti-Corruption Bureau (NABU) and the National Agency on Corruption Prevention (NACP) need strengthening. One immediate area that can help the gathering of evidence is to give NABU the right, under proper due process, to conduct wiretaps and use wiretapping equipment. At the moment the National Agency on Corruption Prevention only has four of the five top management member. Given the scope of work the selection of the fifth member is critically important. The agency should be fully staffed, well resourced, its independence should be safeguarded, and effectiveness of work monitored and assessed by civil society. In fact, civil society has been the main agency of change in Ukraine for many years. It is continuing to push for reforms and in the domain of anti-corruption has had some successes. If not for the pressure of civil society, I doubt that the e-declaration system would even exist. It was one of the commitments that President Poroshenko made to me in May and which Transparency International has advocated loudly. Top politicians and civil servants are supposed to list their assets on this computerised system so that it is possible to monitor illicit income. Although there were attempts to delay it and there are now attempts to narrow the rules on this system, this system must be maintained. The powerful should not be able to dodge this commitment to transparency. The system is not perfect yet, and the technical glitches must be fixed, but when it is in place it can be used to hold those in power to account. Transparency International is asking the National Anti-Corruption Prevention Agency to fully perform its function as an independent administration of e-declarations system. As the IMF and other donors consider how the money they will loan to Ukraine will be spent, they should consider civil society as their allies and should take into consideration their views, particularly on anti-corruption reforms. Transparency International is standing ready to help with this. Alongside them we will evaluate the progress of the reforms, particularly anti-corruption reforms, and we can help them get the return on the investment that both they and Ukrainian deserve.